Guests enjoy free hot breakfast an outdoor heated pool and hot tub complimentary Wi-Fi and in-room microwaves and refrigerators at the non-smoking La Quinta Inn & Suites Temecula. This non-smoking hotel has 56 rooms on three floors and each room includes free Wi-Fi a microwave a mini-fridge a flat-panel cable TV a coffeemaker a hairdryer and ironing gear. Guests can enjoy a complimentary breakfast including waffles cereal muffins fresh fruit sausage and eggs. The hotel offers an outdoor pool and a hot tub for relaxation a fitness room for working out while on the road and a business center for keeping up with the office. Parking is free and pets are welcome also at no additional charge. 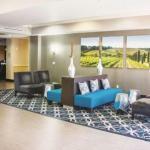 This La Quinta is just two miles from Old Town Temecula six miles from hot-air balloon rides and area wineries. It's 38 miles from San Diego Zoo Safari Park and 40 miles from Legoland. Ontario International Airport is a 45-mile drive. Dogs of all sizes are allowed for no additional pet fee; there is a pet policy to sign at check in, and pet rooms are on ground floors only. Dogs must be crated when left alone in the room, and they are not allowed in food or pool areas.